Delaware INBRE welcomes a new group of biomedical researchers at the program's investigator orientation at Clayton Hall Conference Center. 9:32 a.m., April 19, 2012--Eight pilot research projects led by Delaware investigators were selected for their scientific merit in cancer, cardiovascular health and neurosciences, supported by Delaware’s IDeA Networks of Biomedical Research Excellence (INBRE) program. INBRE is a partnership funded by the National Institutes of Health (NIH) and the state of Delaware among six academic and clinical institutions: the University of Delaware, Delaware State University, Christiana Care Health System, Nemours/A.I. duPont Hospital for Children, Delaware Technical Community College and Wesley College. In addition to proposing compelling scientific research, an INBRE-funded investigator also lays out a plan to seek longer-term funding from NIH and other sources, and is required to work with a scientific mentor. According to principal investigator Karl Steiner, senior associate provost for research development and professor of electrical and computer engineering at UD, Delaware INBRE seeks to help early career investigators to develop their full potential as biomedical researchers. “Within the highly competitive national funding environment, an INBRE grant not only helps a scientist to develop preliminary data, it also helps the person to craft a plan for success,” Steiner said. 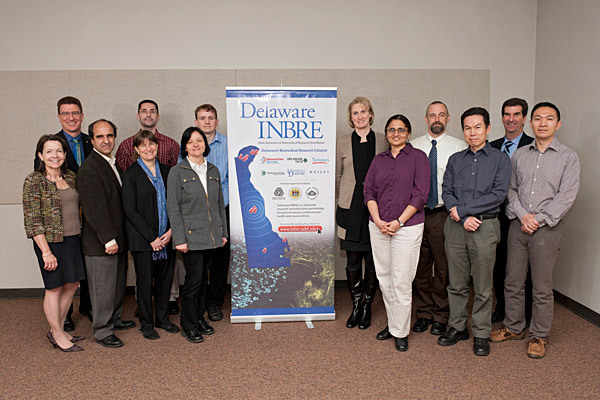 INBRE pilot projects were selected through a competitive peer review process, involving scientists and clinicians on Delaware INBRE’s research committee, as well as reviewers with relevant expertise throughout the country. “We sought the level of expertise and the quality of feedback that would be provided by an NIH study section,” commented Steven Stanhope, INBRE research committee chair and professor of kinesiology and applied physiology at UD. Delaware INBRE is funded through a five-year statewide grant from the National Institute of General Medical Sciences at NIH as well as funding from the state. INBRE also supports research infrastructure investments, core instrumentation centers, and a vibrant statewide undergraduate research program. INBRE programs exist in 24 states to promote the development of scientific personnel at research institutions and undergraduate schools. Protein inhibitors to prevent leukemia relapse: Acute lymphoblastic leukemia (ALL), the most common type of cancer in children and adolescents, currently has a cure rate of over 80 percent. Sonali Barwe at Nemours/A.I. duPont Hospital for Children is focused on the remaining 20 percent of children with ALL, who may suffer an aggressive relapse. The study aims to identify the mechanisms that cause a relapse to occur, and the bone marrow microenvironment may play a significant role, according to Barwe. “The binding of leukemic cells to cells within the bone marrow is believed to prolong their survival and make them resistant to drugs,” Barwe said. To combat this drug resistance, the team is testing inhibitors on the Annexin II protein, the protein responsible for the binding interaction. Using mice as a model, their eventual goal is to block the progression of leukemia by disrupting these interactions. 3-D surgical training: Surgeons require effective training before operating on real patients, and videotaped instruction has long served as a workhorse for teaching new surgical procedures. However, video only provides imagery from a fixed viewpoint and cannot provide depth perception or interactivity. Jingyi Yu proposes to change that. Yu, associate professor in UD's Department of Computer and Information Sciences, will use his INBRE funding to develop a new immersive surgery training system called iSurg that will provide high-fidelity 3D reconstructions of actual surgical procedures. Coupled with a 3D stereoscopic display, iSurg will allow trainees to witness and explore a recorded surgical procedure by navigating through space and time, as if they were there. At the conclusion of the INBRE project, Yu plans to test a prototype at the Virtual Education and Simulation Training (VEST) Center at Christiana Care. Rigid gels in sickle cell disease: Sickle cell disease (SCD) is known to lead to the formation of rigid gels, which can damage red blood cells and obstruct microvascular passageways. Hacene Boukari, associate professor of physics and pre-engineering at Delaware State University, has proposed to characterize both the rigidity and structures of these gels. Boukari will use spectroscopy and imaging to gather that data, which will provide insight into both the pathology of the disease as well as how to treat it. A portion of the funding for this project will go to training undergraduate and graduate students, who will be helping to solve a major public health problem with millions of sufferers. Cardiovascular risk prediction in women: Early detection of cardiovascular risk is the key to improving cardiovascular outcomes in women. Complicated pregnancies may unmask symptoms of risk years before they become detectable; women who have had a pregnancy complicated by hypertension have a two- to three-fold higher risk of cardiovascular mortality in later life. Deborah Ehrenthal, M.D. in the Christiana Care Health System, has proposed to investigate this occurrence by comparing women who have and have not had a pregnancy complicated by hypertension. Her study will identify the metabolic and inflammatory markers, vascular characteristics, and responses to stress that differ between the two groups. This investigation will increase the current understanding of hypertension in women, and lay the foundation for larger studies to improve cardiovascular outcomes. Computational methods to predict protein-protein interaction sites: Li Liao, associate professor in UD's Department of Computer and Information Sciences, is working to develop novel computational methods to predict protein-protein interaction sites. Protein-protein interaction sites are often implicated in cardiovascular disease and cancers, but accurately identifying them poses some challenges. More specifically, computational prediction is held back by a lack of training data that is experimentally valid, the existence of three distinct data types, and the challenges of observing of complex relationships. Liao’s project will attack these issues and carry out a case study of two proteins, JAM-A and CIB1, which are significant in cardiovascular disease and cancers. Quickness training for the elderly: To prevent dangerous falls, traditional exercise regimens for the elderly focus on strength and balance, but often leave out quickness. Christopher Knight, associate professor in UD's Department of Kinesiology and Applied Physiology, will test a six-week fitness program that involves bicycling to improve both physical and cognitive quickness. The high-speed stationary bicycles provide users with a low-resistance workout from a reclined position, which makes them safe even for the frail. This project will also examine the changes in the nervous system that occur with improvements in mobility. According to Knight, “This cycling intervention is aimed at improving both body and mind in older adults for a better quality of life.” He said he hopes the project will support the addition of neural based quickness training for aging adults. Molecular mechanisms of medulloblastoma: "Medulloblastoma is the most common malignant brain tumor in children. Unfortunately, while cure rates are improving, survival is still poor and survivors suffer from serious long-term effects of the therapy. Clearly, new and safer treatments are needed,” says Sigrid Langhans, of Nemours/A.I. duPont Hospital for Children. Langhans has received an INBRE grant to study the molecular mechanisms responsible for the oncogenesis and development of medulloblastoma. The study will examine mutations in the sonic hedgehog (Shh) pathway, which plays a fundamental role in cerebellar development. Inhibitors of Shh signaling show promise for adult cancer therapies, but are undesirable in pediatric settings because they cause side effects in bone development. Langhans hopes that results from this study aid in developing more effective targeted therapies with fewer side effects for children diagnosed with these devastating tumors.